"Hey, you cheated! You made this chicken pie with supermarket puff pastry and roast chicken!" said my fussy husband. "Oh yeah!" My son suddenly realised the same too! "Mum, is it really true that this pastry is not homemade? You know that I prefer your homemade pastry from scratch!" "Sorry, guys. Sometimes, mom is tired and needs to take shortcuts." And I wonder why am I trying to explain for myself. It is a delicious chicken pie anyway... Not as if I have committed a crime or cooked such a terrible dinner! Hmmm... I know that I'm probably too nice because this chicken pie is REALLY very delicious!!! You might ask... What is Jalousie? Is it a chicken pie? The word, Jalousie refer to a blind that is made rows of angled horizontal slats. For cooking, it is also used to name a puff pastry that is baked with a horizontal blind-like design. Jalousie pastry is quick, simple and easy to make and they are commonly made with ready made puff pastry with shredded cooked chicken or even canned tuna. So, back to the question... Is Chicken Jalousie a chicken pie? Yes, sort of and the classic way of baking a Chicken Jalousie has to include mushrooms and leek, all cooked in a cream based sauce. Yum yum! I can sure that this quick and easy Chicken Jalousie will impress your friends and family or unless they are as fussy and picky as my husband and son. LOL! Yes... Baking this impressive chicken pastry is as easy as 1 + 1 + 1 = dinner!!! It is as simple as... leek + mushrooms + store bought roasted + cheese + puff pastry = chicken jalousie! 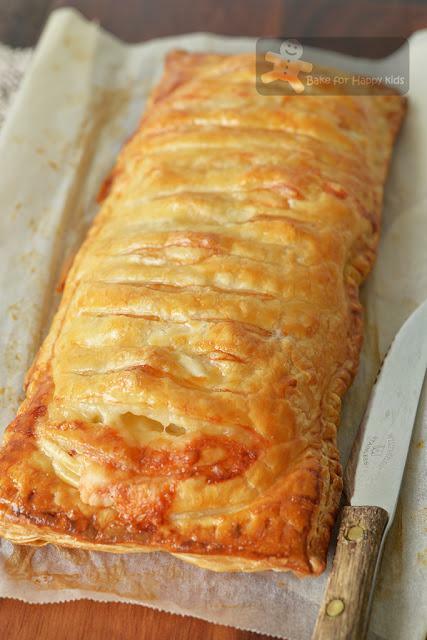 Watch my video and see how easy is to bake this delicious chicken jalousie. When one of my colleagues saw my video, she immediately said that she wanted to bake this too! Oh well, we are all busy people. And we want to eat delicious good food too! 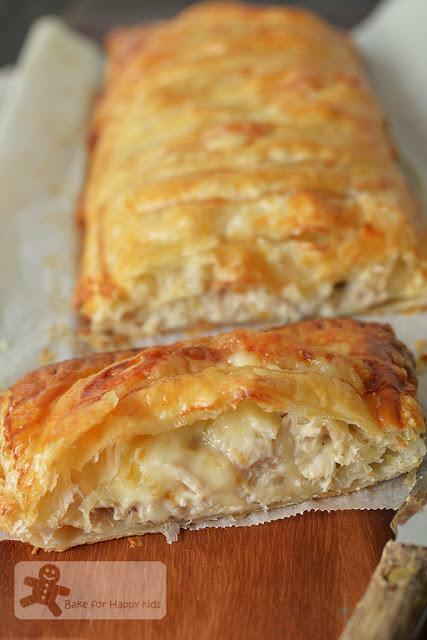 We are ready to feast on this delicious Chicken Mushroom Leek Cheese Jalousie. Impressive!!!??? Shhh... Don't tell anyone that you baked these with store bought roasted chicken and ready-to-use puff pastry. Just let your friends and family enjoy this lovely dish! LOL! Here's the classic recipe that is adapted from the book, ABC Delicious Baked by Valli Little. 1/2 cup (125ml) cooking cream - Please use cooking cream with 18% fat as other regular non-cooking cream will split in the presence of high heat. *Fontina cheese is an Italian cow's milk semi-soft cheese. Aged and pungent with rich nutty flavours. There are also Swedish and Danish versions (like the one I used) that are commonly available in most deli shops and can distinguished from the Italian Fontina by their red wax rind. Place butter and oil in a medium cooking pot over medium heat. Add leek and cook with stirring for 5 mins or until softened. Add mushroom and thyme, then cook with stirring for 1-2 mins until softened. Add flour and cook with stirring for 1 min. Stir in stock and cream and cook for 1-2 mins or until sauce is slightly thickened, then stir in chicken. Season with salt ans pepper. Set aside to cool to room temperature. 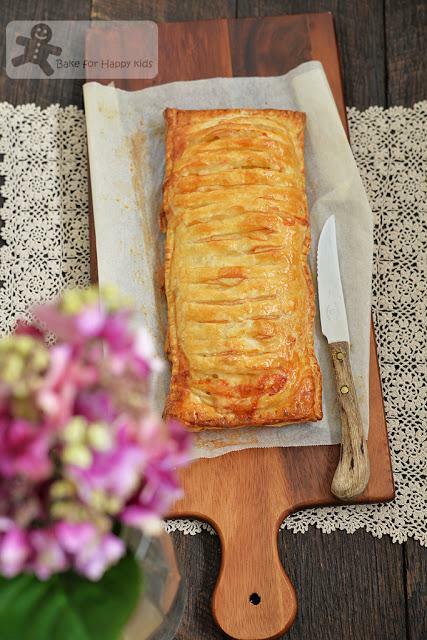 Cut each rolled puff pastry into two 12cm x 24cm rectangle. Place one pastry on the baking tray, then spread over half of the chicken filling, leaving a 1 cm border. Scatter with half of the Fontina cheese and brush the pastry edges with the beaten egg. Gently fold the other pastry in half lengthwise. Use a sharp knife to make cuts at 1 cm intervals down the folded side, leaving a 1 cm border on the other side. Carefully open up the folded pastry and place over the filling. Then, use a fork to press and seal the edges. The top pastry should separate slightly to reveal some of the filling. Repeat these assembly steps with the remaining pastry, chicken filling and Fontina cheese to assemble another jalouise. Brush jalouises all over with beaten egg and bake for 30 mins or until puffed and golden. Cut into slices and serve with salad while the pastry is still warm or at room temperature.